First of all, CONGRATULATIONS! We couldn't be more excited for your recent change of status. Now it's time to celebrate your first holiday season as Mr. and Mrs. with holiday cards for newlyweds. 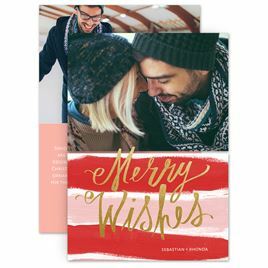 These cute and clever greeting cards are designed to celebrate your newly married status while still spreading the joy of the holiday season. Browse our many photo Christmas cards and other unique designs like faux glitter, chalkboard styles and ornament shapes. We also offer Holiday Cards for Families for those of you enjoying your first year as one happy family.